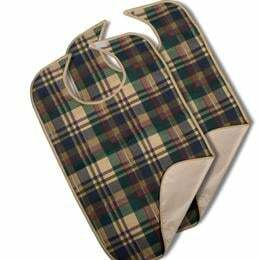 Impervious Tartan Clothing Protectors: Clever Plaid Design Seems To Made Stains Disappear. These Clothing Protectors Are Constructed From Durable Canadian Ibex (80% Cotton/20% Polyester) With A Full-Sized Fluid Proof Vinyl Barrier. 21" X 33", Plaid With Protective Back, Snap Closure.